The atmosphere at a basketball game is very intense. Few sports can generate such a vibrant energy. Perhaps it is the players running in sharp bursts of seconds at a time, timeouts and free throws that are the reason why fans' hearts beat at another rhythm. Or maybe it is the high-spirited mood that spreads across the stands. The passion that reigns over a basketball court is one of a kind. If that court is also holding the Copa del Rey final, the energy is through the roof from the moment it is even announced. So how can we fill the time until then? A walk through the history of this competition, basketball's most longstanding in Spain, seems like a great idea to whet the appetite. All this magic in Copa del Rey finals is nothing new. On the contrary: the cup was first contested in 1933, and, since then, this competition has become one of the most awaited and influential events on the Spanish sporting panorama. This edition, whose final will be held between 14 and 17 February in Madrid, has had 82 precursors come before it.CaixaBank is offering an audiovisual journey through them all in a photographic exhibition, and with videos of the most dramatic moments, held in CaixaForum Madrid until 17 February.An excellent context for understanding what is to play for in February, when eight teams prepare to get the stands roaring once again. At the same time, visitors will be able to see the prized trophy on display. These are some of the graphic and visual records on show at CaixaForum, which will help both fans and the uninitiated to discover why the Copa del Rey of Basketball is so special. A true Cup final in the interior gardens of a building. The beginnings of basketball in Spain were quite different from today. Everything was incredibly amateur, with games being held in places like tennis courts or handball courts with concrete floors. El Rayo Madrid played Real Madrid Baloncesto in the first edition, held in 1933 in the garden of the old Goya cinema. Two years earlier, Real Madrid had signed its first star players with an announcement in the ABC newspaper, which said: "We ask all gentlemen interested in this sport to come by the club's secretariat, Caballero de Gracia, 15, for instructions". Thus, this was the great-great-grandfather of the NBA draft and the current market of ACB signings. During the '70s, derbies between Real Madrid Baloncesto and El Estudiantes were constant, as reflected in CaixaBank's graphical journey through the history of the Copa del Rey of basketball. In line with the fascination that comes with these games, here we have a curious image with a story behind it. 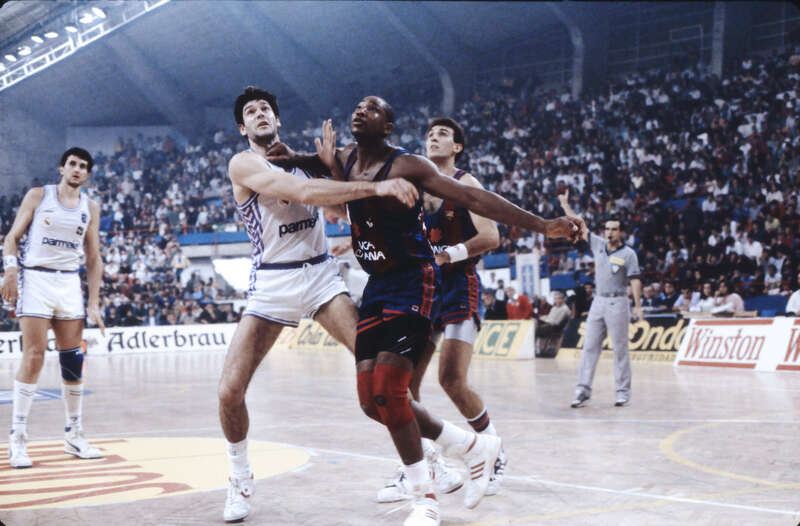 José Ramón Ramos, a talented player trained in the Instituto Ramiro de Maeztu, played with Real Madrid Baloncesto for six years before returning to El Estudiantes. Here we can see him with the Real Madrid shirt in a Cup semi-final against his alma mater in the early '70s. In the '70s, the Cup also said farewell to one of the first legends on the benches. Pedro Ferrándiz left Real Madrid at his peak, having won 11 editions with the club since 1960. 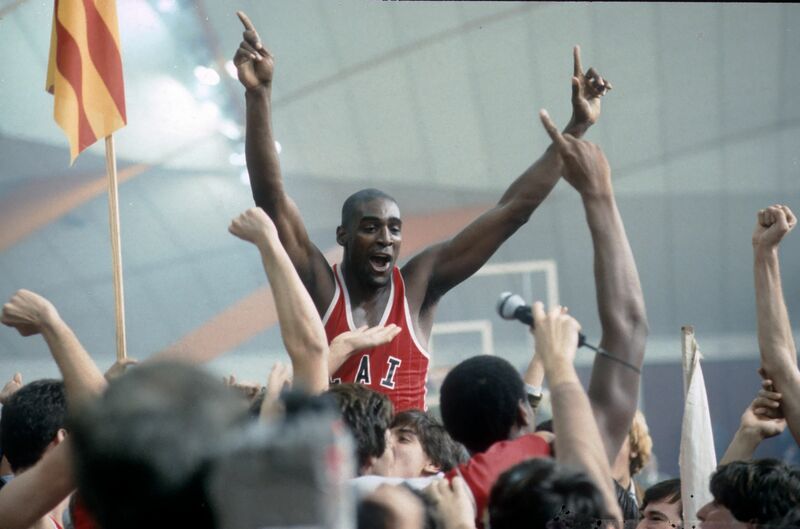 We can see his teammates lifting him in this picture, after winning his last final in 1975. Nearing the mid-'80s, the Cup had reached a kind of impasse. The League was eclipsing the competition, having almost turned into a private event for Real Madrid and Barcelona. Between them, the clubs already had 31 titles. However, in the 1983-84 season, the ACB took over the organisation and implemented a finals system that saw four teams play against each other in the same location, where they could have two foreign players. The objective was to create a more spectacular competition. Zaragoza hosted the first final, with the CAI as the home team. Zaragoza's fans responded very positively to the ACB measure. The expectation of seeing their team play against the giants of Real Madrid, FC Barcelona and Joventut de Badalona was enormous. This enthusiasm spread across the whole country, with 10 million television spectators tuning in for the final. Against all odds, CAI Zaragoza ended up lifting the cup, after beating Joventut in the semi-finals and FC Barcelona in a thrilling final that finished at 81-78. The image of a euphoric Magee lifting his arms as he is passed through a sea of fans is a perfect summary of what those two days meant for the history of Spanish basketball. The history of Spanish basketball was built on huge names. In this regard, the echo of the difficult duels beneath the hoops between Fernando Martin and Audey Norris (in the image) still resound. In the same photo, we can see them flanked by the giants that are Fernando Romay and Epi. But there were many more names that still resonate in the public imagination: Figures such as Corbalán, Drazen Petrovic and Jordi Villacampa took the baton from the likes of the Alonso brothers, Marcelino Maneja, Eduardo Kucharski and Clifford Luyk. These were followed by current key players like Pau Gasol, Ricky Rubio, Sergio Llul and Juan Carlos Navarro. These names all have something in common: at one time or another, they have all been pushed to the limits in a Cup final, like the one between FC Barcelona and Taugrés in Seville in 1994. The picture, which shows the standoff between Massenburg and Rivas, reflects how the tension of the last game is able to ignite sparks. Basketball in its purest state. Ferran Latorre: "Close to the summit, you realise that this is an important moment in your life"